Mustafa Kemal Ataturk is the one man who you are going to see everywhere you go in Turkey. Displayed on the Turkish money, on flags and in shops, and offices, you will also see a statue of him in every town. It jogged my memory to tell you, as I was out the other day and there was a huge flag of him displayed next to the Turkish flag. You may spend all your holiday wondering who he is, as the Turkish people do not really talk about him that much but he was the founder of Turkey. He formed the Republic of Turkey in 1923. Previously the land within it’s current borders was part of the Ottoman Empire. He abolished the Islamic justice system and adopted western justice and law methods. He introduced the language, known as Turkish by adopting the Latin alaphabet and helped a whole country to learn it within five years. He made it law that women could wear their own choice of clothing. Previously the headscarf was compulsory. 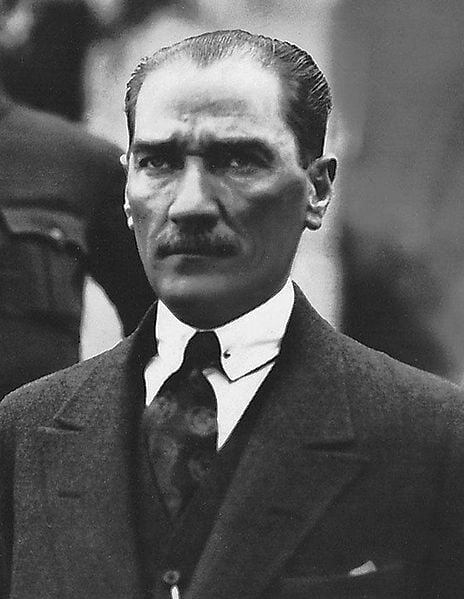 Thanks to Mustafa Kemal Ataturk, Turkey is now the only predominately Muslim country in the world with a democracy. He moved the capital from Istanbul to Ankara where it was less vulnerable to attack. 10th of November of every year is Mustafa Kemal Ataturk day. Flags of him will be in streets, out of the windows and houses. Turkish Schools will also have a minute’s silence. As you can see from the facts above, he is a major part of Turkish history and modern-day life however, you do not actually hear many people talking about him unless you bring up the conversation. If you do, expect Turks to speak very highly of him. I too respect him as he has made Turkey a lovely and beautiful country that welcomes strangers and friends from all across the world. Heroes who shed their blood and lost their lives! as for some of the comments above about him, and the way he treated minorities in Turkey, all i can say is it was a very different time, and he was sculpting a huge, relatively undeveloped country, into a modern, go ahead country, that would eventually be able to take its place at the big table so to speak. that his legacy seems to be being dismantled recently is very sad. he was no saint, but as an outsider, i feel that the good he did for Turkey far outweighs his faults. I am an American man who married a Turkish woman. It is an understatement that most of us in this country know nothing about Turkiye. Perhaps we are just so arrogant to think that our country is the only one of importance. Or that our way of life is the best. I have traveled to Turkiye several times from Istanbul, to Izmir, to Pamukkale, to Antalya and Ephesus. It was a fantastic experience and taught me so much. Most Americans hardly leave their home town and most never traveled to another country. Also, we learn a little about the Ottoman Empire, but really nothing about Turkiye in school. Very interesting blog. My ex had two tours in Turkey. She was befriended by a Turkish family and just loved it. Later on, we hosted a Turkish Officer at our home in the US. He spent about a month with us. It was fascinating to observe what he knew about the the US and what he did not. There are a zillion stories of that visit but I’ll just share that he was a gentleman. Hi, I found your blog and enjoy reading the point of view a foreign people about Turkey. But there is a major mistake in your post. Ataturk did not introduce Turkish he just changed the alpabeth from Arap alpabeth to Latin. Turkish is very old language and spoken by Ottomans too. I have to say that this is very offensive to give wrong information about one nation’s language. Could you please correct your mistake because it could be misleading to people who read your blog. Natalie — I have LOVED your blog entries, as I recently completed a 2-year tour of duty in Turkey. I must say that it was the best two-year period in my military career. I want to laud you on the way you are handling the political / historical comments made in this thread… unfortunately History and Politics are strange bedfellows that cannot be untangled, and talking about one necessitates bringing up the other… and you have done so in a very delicate manner. Thank you for keeping this blog (and the comments) non-inflammatory! Can’t wait to keep reading your blog now that I am back in the states… I miss Turkey terribly. Hi Harry, Unfortunately dates are not displayed on this blog but this post was written when I first set up the site in 2010. Maybe that is where the confusion is, re open conversations in public. Although the balance is shifting in Turkish society, it is not at high level so my question to you is to review Turkeys policy on Internet publication about certain topics. After all, it was not that long ago, that Twitter and Youtube was banned. Hint hint!!! I think you are clever and educated so you should know what I am getting at. Also as mentioned before, the topic of this blog is travel, not politics. Sorry but from what i saw, a lady up there felt “insulted” because you “dared” to mention that Kemal is not such a hot topic in modern peoples” conversation nowdays (big deal, haha!). I meN, come oon! We are talking about a country where you cant find a single village without a monument of Kemal, this is their planned education strategy, kemalism, nationalism and statism. Duribg Kemal’s era, Greeks, Armenians, Kurds, Assyrians, Pomaks, in short ANY kind of national or cultural minority was suppressed to the level of extinction. Let me propose an exercise: search for the percentage of Christian population in Anatolia, Before Kemal, and then, the relevant percentage AFTER Kemal. You ‘d be surprised. However since i think you are clever and educated i figure you already know these stuff. So my humble question is: why dont you keep a balance when writing about Kemal? Ok, he forbade the burkha. What happened to the liberties of the christian somen during his reign?? I saw something about Ataturk that made me respect him even more. When touring in Side, Antalya province, I visited the official museum with the Greek ruins. A plaque at the restoration site talked about the history of archaeology in Turkey, and said there were no archaeologists in the country during the Ottoman era. When the Ottomans left power, all of the ancient ruins were in, well, ruin. Ataturk sponsored young Turks to study abroad and serve their country as archaeologists. He helped put in place a system to find, categorize and restore ancient sites. He had the foresight to recognize that Turkey was uniquely rich in history, and relics from all the eras needed to be preserved. Thanks to Ataturk I can’t bring home ancient coins or cool Ottoman genie lamps from Turkey. Haha! I learned a lot of things about Ataturk and I am very thankful to him, he is so open-minded, without him Turkey could be similar to Middle East where 4wives and marrying a child are allowed. I just don’t think he banned a headscarf, he just gave a women a freedom to choose about clothing. He wanted all Turks to live in harmony without separation special about religion. Most of the Turkish people are warm and behaves good to you ? think you did not came across good people. I went to Turkey and did not enjoy being there one bit. The people were awful to me and I did not think they were very smart. I’ll never go again. I like Greece so much better! 1 – I have changed your name to John. This is a travel blog, not a political blog so please do not come on here with your political agenda as I will edit the comment. I have already explained this in my commenting policy which obviously you did not read before typing. 2 – If you are so much into your political ideas that you have to come on here and be rude. Why did you use a false name, email address and website address? Are you afraid to stand behind what you type? Your IP address shows you are in America. You have freedom of speech there don’t you? 4 – I learn about Turkey when I want and how I want to. And guess what? If I want to know about Kurdish people, I will ask my Kurdish husband. Certainly not someone like you, who is incapable of typing a comment on a web page without being rude. 5 – Last warning. Your next rude comment does not get published. you probably haven`t seen the Kurdish situation in Turkey for the last 100 years. Of course stupid and ignorant people don `t use their own brain to think, but get everything indoctrinated from the official ideology . Congrats. But as you said. It is never too late to learn. Atatürk is one of the biggest ****** in history. Read about Dersim and Armenians and you will learn a lot. Mango’s book is the more recent, is well documented but yet easy to read. Kinross interviewed many of Ataturk’s contempories (all are gone now) for his book. i think d gov. should change d rules..for allowing photograph and vcam..
Hi Ozlem, the comment was in no way meant to be an insult. It is based on 11 years of observing Turkish culture and traditions. To speak to a Turkish person about Ataturk, I have always had to raise the topic first. For example, when I first arrived in Turkey and I asked about the man on the flags in shops etc. My comment is not based on recent observations. The way it was explained to me is that Ataturk is such a major part of Turkish life so people don’t talk about him that often. Perhaps the circles that you move in are different to the people that I have meet but every conversation that I have had about Ataturk has always been instigated by me. Re – your fashionable circles. I have met a couple of people and when I questioned them about Ataturk, their answer was rather surprising. I have preferred not to continue their conversation because while I have experienced Ataturks presence in daily life, in order to continue the conversation I would have to to fully understand his legacy and goals, I would have to study his history in depth. Yes, I have noticed that there seems to be a growing presence of people who disregard Ataturks place in Turkish history but the pure fact is that he will always have a presence. No-one can take this away regardless of their political views. I was born and raised in Turkey, attended college and graduate school in the US, and travelled back and forth many times. Over the years, I have had countless conversations with foreigners about Turkey, and although they didn’t usually know much about Turkey, they almost always knew of Ataturk. I found this to be interesting, so I started asking them how they knew about Ataturk, when they knew so little about my country. The answer I consistently got was that as a foreigner, you couldn’t get past a Turkish ciitzen who would not give you a 2 hour lesson about Ataturk. As a Turkish born and raised citizen, I grew up in homes where Ataturk’s portraits adorned the walls, and heard many conversations about Ataturk and his accomplishments. People of Turkey are generally very proud of Ataturk, and will talk to each other and those from other countries about Ataturk, and the fact that if it wasn’t for Ataturk, we would not be living freely on our own land today. I am hoping your comment was based on recent observations, as Turkey is in the midst of political change, and in some “circles”, it is fashionable to disregard Ataturk and everything he has done for Turks and Turkey…But to make a blanket statement and say “”You may spend all your holiday wondering who he is, as the Turkish people don’t really talk about him that much. ” is insulting to the rest of us who do anything we can to keep Ataturk alive in spirit. Hi Omer, Thanks for your kind comments. I am happy that you like my blog. Also thanks for correcting me about the Turkish language. It is never too late to learn! I’ve always been wondering about what westerners think/say about us or my country. I have lived in the U.S. and couple of European countries for some years but I cannot get a clear picture of their view as some seem to have no idea, some don’t like and at last some of them love it. I even buy the history books written by western historians and compare what I’ve read and been taught in school to see the difference. Long story short, stumbleupon led me here and I’ve been reading to the last bit since then 🙂 I must say it’s a lovely blog, very nice design and your positive writing attitude makes your posts enjoyable. As you already described above, Ataturk is the most respected and we do not talk much about him, true! and that is maybe after spending our entire education life learn everything about him we consider everyone as well already knows about him 🙂 one other reason could be, there are so many things about him to talk and we just don’t want to start.. the conversation will not end for some time..
4 – He introduced the Turkish Language and helped a whole country to learn it within five years. * Actually he introduced the Latin alphabet for Turkish language. In Ottoman Empire the spoken language was Turkish but it was written in Arabic alphabet. again, lovely blog.. following you!